Agartala, Aug 31 : An 18-year-old logjam on the repatriation of a group of Mizo tribals from relief camps in Tripura has now thrown up a new challenge: whether or not their names should be included in the electoral rolls of their home state. Around 31,300 Reang tribals, who locally call themselves "Bru", have lived in makeshift camps in northern Tripura since October 1997 when they fled western Mizoram after the killing of a Mizo forest officer triggered ethnic violence. "The special summary revision of electoral list of Mizoram being undertaken by the state election department would not cover those tribals living in relief camps in Tripura," state Chief Electoral Officer (CEO) Manisha Saxena told IANS. "The state election department did not receive any instruction from the Election Commission to cover the tribal refugees in the special summary revision of the photo electoral rolls," she added. Following the Election Commission's advice, almost all the states in the country are undertaking a special summary revision of photo electoral rolls with January 1, 2016, as qualifying date. Earlier, Mizoram Chief Minister Lal Thanhawla and various political parties of the state had demanded that the Reang tribals, who had refused to return to Mizoram despite a series of attempts to repatriate them, should be excluded from the voters' list. Refugee leader Bruno Msha said the Mizoram Bru Displaced People's Forum (MBDPF), the lone organisation of the refugees, has taken up the matter with the Election Commission and urged the poll panel to conduct the special summary revision in seven relief camps as was done earlier. "If the Reang refugees remained out of the revision process, it would be a blatant violation of the fundamental rights of genuine Indian citizens," Msha told IANS. "The MBDPF urged the election commission not to fall into the conspiratorial move of the Mizoram state government which is depriving the non-Mizo tribals in numerous ways." The Tripura election officials are saying that to conduct the summary revision of electoral rolls in the relief camps of northern Tripura is the duty of Mizoram. "The special summary revision of photo electoral rolls would be done according to the existing voters' list prepared by the Mizoram election department," Tripura's additional chief electoral officer Debashish Modak told IANS. 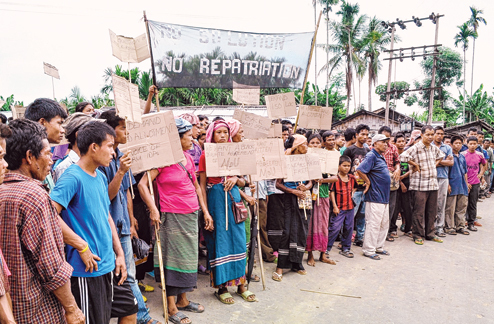 After the central and Tripura governments' pressure, the Mizoram government had decided to take back the tribal refugees in a phased manner from June 8. Before that, the Mizoram government conducted an identification camp in each of the seven camps from June 2, but none turned up in the identification camp, the last phase of which would be ended this week. Refugee leader Bruno Msha said that the Mizoram government's plan to rehabilitate the repatriated refugees is faulty, impractical and unilateral. "We want a written agreement with the Mizoram government before the repatriation. The central government must be involved in the process," Msha, general secretary of the MBDPF, added. "We have, on a number of occasions, told the central and Mizoram governments that the refugees are willing to return to their homes in Mizoram if their 10-point demands, including security and rehabilitation, were met," he added. In its six-page memorandum to central government, the MBDPF had accused the Mizoram government of discriminating against the tribals. According to the Mizoram government's repatriation roadmap, the refugees willing to return to Mizoram will be rehabilitated in Mamit, Kolasib and Lunglei districts. The Mizoram government has offered a Rs.85,000 rehabilitation package for each family along with free rations for one year. The refugee leaders are demanding higher compensation. They have put forward a charter of demands that includes financial assistance of Rs 150,000 per family, free rations for every repatriated family for two years, cultivable land, a political settlement of the ethnic problem and adequate security, among others. According to a union home ministry report, Rs.246 crore has been released to the Tripura government since 1997-98 for the maintenance of the refugees and around Rs.45 crore has been given to the Mizoram government since 2004-05 for disbursement to migrant families for their rehabilitation in Mizoram.